was about half an acre in size and over the years this has increased to about four acres, the extra land being given by various benefactors. In 1538 a mandate was issued ordering records of burials to be kept. Most parishes’ earliest records including All Saints’ were destroyed or lost. The oldest found gravestone in the churchyard is dated 1658. There are other interesting graves including that of Sir Joseph Swan FRS, the great inventor who died in 1914 and Richard Ward, who died in 1878, having established Methodism in Warlingham. The inscriptions on tombstones are currently being recorded. A memorial garden for the interment of cremated remains was created in 1953. 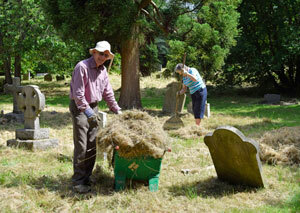 This country churchyard is managed as a conservation area, providing a haven for wildlife. Grassland and hedges are allowed to remain uncut in some areas until wild flowers have seeded and birds have fledged. Surveys have indicated that this plan is working as there has been an increase in the species of flora recorded; stag beetles (an endangered species) have also been found. There are about 200 trees of many varieties including several ancient English yews, one of which is believed to have been planted when the church was built. The oldest yew is thought to pre-date Christianity. An English oak tree was planted by Professor David Bellamy during the Churchyard Festival in 2008. 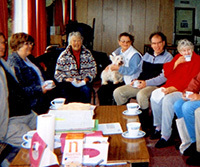 Volunteers undertake much of the management programme. They meet on the third Saturday of every month from 10am to 1pm with a break for FREE coffee and doughnut. Volunteers are welcome, including children who must be accompanied by a parent/carer. Just turn up in gardening clothes, tools are provided.